It was an uneventful Friday-morning commute for the D.C. area after a horrific traffic backup shut the Inner Loop of the Capital Beltway for more than 13 hours on Thursday night. 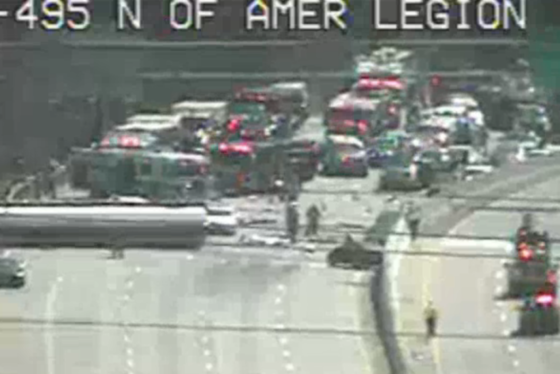 Lanes reopened on the Inner Loop on the American Legion Bridge just before 3 a.m. Friday after a tanker-truck overturned around 1:50 p.m. Thursday, closing lanes for hours and snarling traffic all over the D.C. area just before the evening rush hour. The crash left drivers in bumper-to-bumper traffic on all of the alternative routes. About 120,000 motorists were affected, according to Maryland’s Department of Transportation Charlie Gischlar. He told WTOP the average traffic volume on Interstate 495 at the American Legion Bridge is 238,000 vehicles per day. Clean up took all of Thursday night, finishing around 2:30 a.m. Friday, when the tanker truck was removed from the roadway. Lanes opened around 3 a.m.
Traffic delays were felt well into the night; Inner Loop traffic was being diverted onto Virginia State Route 123. Traffic was jammed at every Potomac River crossing, including the Chain Bridge, the Key Bridge, the Memorial Bridge and the Roosevelt Bridge. What should have been a normal afternoon commute was already exacerbated by the sold-out home opener at Nationals Park, which drew in more than 42,000 fans to D.C. Thursday. Drivers were warned to steer clear of the immediate crash area, but delays were felt miles away. “Every route into D.C. was jammed. It was all bailout traffic,” said WTOP Traffic reporter Rich Hunter, who works the night shift and had to weave his way through D.C. neighborhoods to get to work, something that took him three times as long as it normally would. Jessica Mack, through Facebook, told WTOP it took her two hours to get from the National Institutes of Health, in Bethesda, Maryland, to Reston, Virginia. Lauren Dore, of Great Falls, Virginia, wrote to WTOP to detail her trek to Georgetown University, where she’s a graduate student. “My Thursday class is at 5 p.m. and I usually leave at 4 p.m. and am the first one in class.” This time, however, she left at 3:45 p.m. and got to class after 6. “I went from Great Falls around through Fairfax through Springfield to Arlington, ended up by the Wharf, then Rock Creek Parkway, finally to Georgetown,” where it took 40 minutes to travel the last half-mile. The Virginia Department of Transportation tweeted frustration at drivers who were slowing down to film the crash scene as they passed by. Virginia Department of Transportation’s Ellen Kamilakis said last June’s Woodrow Wilson Bridge truck fire was similar to Thursday’s incident. It lasted 12 hours and 39 minutes. Another incident on the Prince William Parkway last August caused traffic problems for 7 hours and 27 minutes. The tanker crashed onto a barrier on the right side of the road and overturned. The truck was loaded with 8,500 gallons of fuel, some of which began leaking out after the crash. About 100 to 200 gallons leaked out, but none of it got into the Potomac River, Fairfax County Fire and Rescue’s Ashley Hildebrandt said. The truck overturned at 1:50 p.m., said Corinne Geller, of the Virginia State Police. “This crash actually occurred on the Virginia side of the American Legion Bridge, but it had an obvious effect on the Maryland side of the bridge,” Maryland’s Gischlar told WTOP. 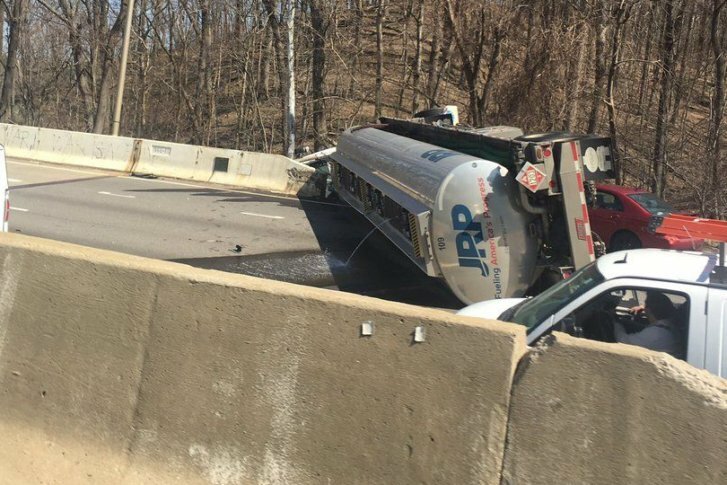 Another vehicle struck the tanker as it overturned, but no one was injured. The truck’s cab ended up off the road and three cars got caught up in the accident, but there were no serious injuries. Emergency crews found three leaks in the truck and sealed them. After they stopped the leaks, authorities had to transfer all of the gasoline in the tanker to another vehicle before they could begin putting it upright. “We are very lucky that the fluid didn’t ignite,” Gischlar said. Agencies involved in the cleanup included Fairfax County Fire and Rescue, Virginia State Police, VDOT, the Virginia Department of Emergency Management and others. WTOP’s Abigail Constantino, Colleen Kelleher, Jack Pointer and Michelle Basch and the WTOP Traffic team contributed to this report.